Science in the service of beauty. After 10 years of research Utsukusy presents in March 2017: Artificial Skin. The latest anti-aging method. This innovative serum forms a very thin, breathable second skin so that the skin is protected from external influences, such as environmental pollution, air conditioning, heating and smoke. The skin significantly retains more water, so that a dry and flaky skin can breathe and recover easily. 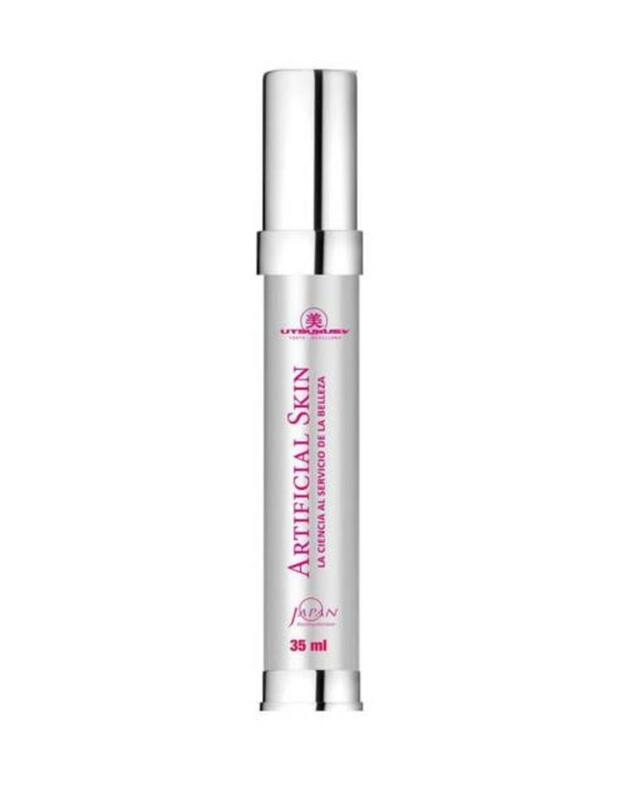 Drought Lines disappear, the skin structure becomes a dense and firm skin again and the Artificial Skin serum stimulates production of collagen and fibroblasts in the skin. Wrinkles become less deep from the inside out, and the skin is visible firmer and more elastic. In a week it improves the firmness of the skin and reduce fine lines. In just four weeks, skin looks smoother and regains its firmness and elasticity. 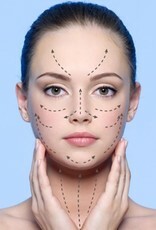 The facial contour is more firm and well-defined. 96% of the users tested showed a significant reduction of lines and wrinkles. 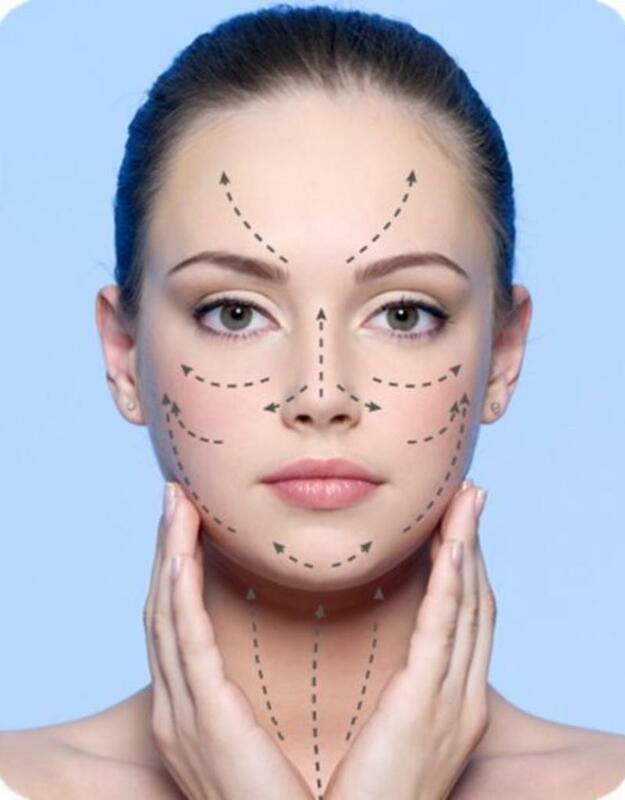 By using the Artificial Skin serum an increase in the number and size of dermal papilla is detected. This increases the contact surface area between the dermis and epidermis. This promotes the flow of nutrients to the epidermis and promotes communication between the two skin layers. 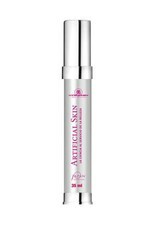 The result is a soft, flexible, sturdy and deep-hydrated skin with less visible wrinkles. Based on vegetable silicone having a high molecular weight in order to protect the skin. 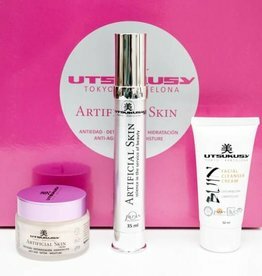 Artificial Skin contains seaweed (pentasaccharide marine) having a low molecular weight so that the active ingredients can penetrate into the cell nucleus and the bean galactomannan that hydrates the skin deeply. 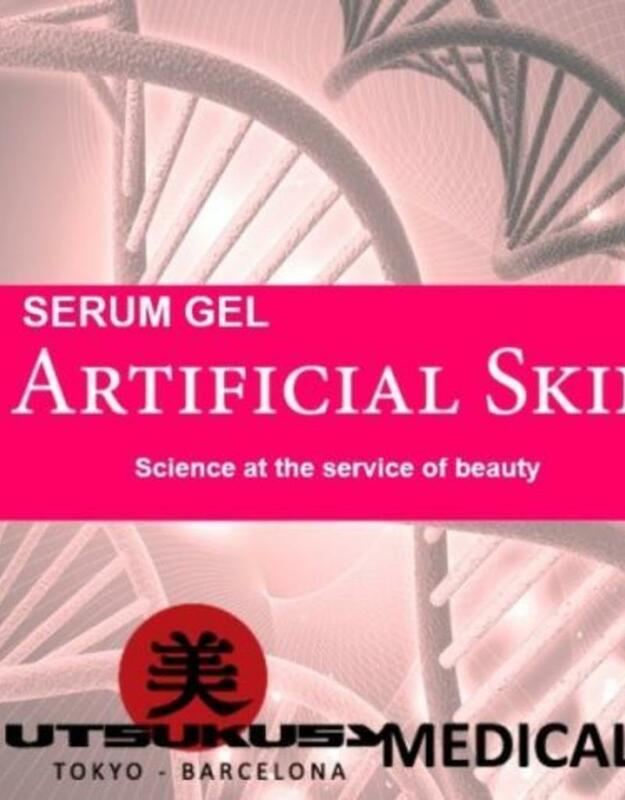 The Artificial Skin serum is biocompatible. Enteromorpha compressa is extracted from a pentasaccharide MARINE (MPS), the main component of the vegetation of sea areas under high stress and major changes. 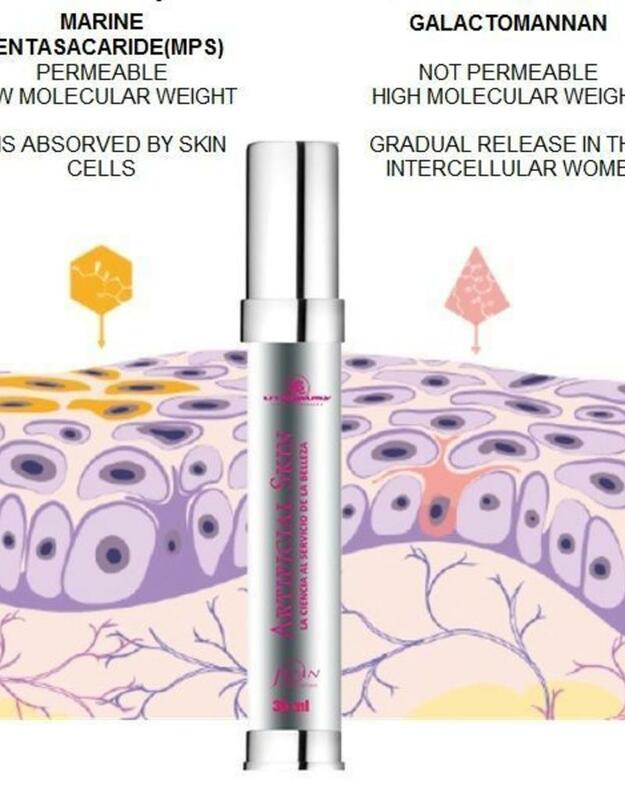 Improves the production of collagen in the skin fibroblasts. Inhibits the synthesis of matrix metalloproteinases (MMPs) inhibits inflammation. Caesalpinia Spinosa is extracted from galactomannans. These are high molecular weight polysaccharides which have a natural moisturizing function in the seed, preventing moisture loss when the plant grows from the seed. This unique ability to retain moisture is simmular in the Artificial Skin serum. 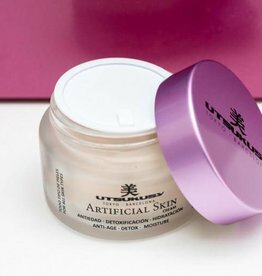 The rusult is that moisture in the skin gets trapped in the high capacity and therefore prevents skin dehydration and recoveres the dry skin from the inside out. For extremely dry skin and deep wrinkles: use the Artificial Skin Serum morning and evening after cleansing the skin with Bijin Facial Cleanser cream and before applying the cream. Massage the serum from the neck to the forehead. For dry to-normal skin: use the Artificial Skin Serum morning after cleansing the skin with Bijin Facial Cleanser cream and before applying the cream. Massage the serum from the neck to the forehead. 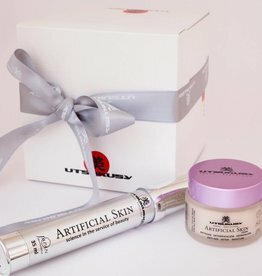 For mixed to oily skin: use Artificial Skin serum in the evening, after cleansing of the skin with the Bijin Facial Cleanser cream, and for the application of the cream. Massage the serum from the neck to the forehead. Artificial Skin is selected out of 40 entries and is nominated for Professional Beauty Product of the Year at the beautician exhibition Beauty Trade Special. For professionals the Artificial Skin salon treatment is available. 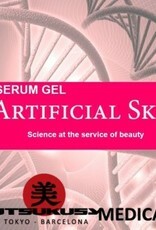 Introduction price of Artificial Skin Serum: now for € 56.00.